I am by nature a skeptical person, who rather enjoys debunking things. So, a few years ago, when I decided to dig into the many hopes and fears about accessory dwelling units (also known as ADUs, granny flats, in-law units, laneway houses, etc) I knew I might end up shooting myself in the foot. After all (full disclosure here), I have an ADU of my own, and am one of the editors of a site about ADUs. I had a notion that this form of development was a promising nod towards a gentler, more sustainable society. But what if it turned out there was no objective evidence that ADUs had any benefits beyond my own yard? ADU advocates said ADUs would create affordable housing, house older citizens (less popularly known as “the elderly”), create “green,” less car-dependent housing, and generally strengthen informal family and neighborhood ties. ADU opponents said that ADUs would create parking problems, bring down property values (and generally bring in undesirable people), create overcrowding, change the appearance of neighborhoods, generate noise and garbage, and perhaps end the single-family nature of existing neighborhoods. Meanwhile, in the more formal literature, there were some comparative analyses of policy. In short, there was plenty of talk about the idea of ADUs, but virtually nothing about the reality of them. There was close to zero factual information about how many ADUs exist, who lives in them, where they are, how many cars come with them, and so on – the kind of basic factual information that should inform policy and debate. Are ADUs a confusing topic? Definitely. Here’s why. Do ADUs actually provide housing? Yes. The great majority are used for long-term housing, though flexibility for occasional other uses is a big motivation for people to build them. How much do ADUs cost to build? It varies a lot, but averages in Portland are $45,500 for attached and $90,000 for detached units. How do ADUs affect neighboring property values? There is no direct evidence, but homes in denser, more “new urbanist” neighborhoods (including features like ADUs) have higher sales prices. Do ADUs create parking problems? There is zero evidence for this idea. Legal ADUs are extremely rare. Moreover, they contribute fewer cars per household than SFRs, almost as low as “transit-oriented” apartments. Do ADUs serve the elderly, either as residences or investments? At this time, not in particular. But a decade from now, probably – read why here. How much do ADUs support the community economically? Quite significantly, through construction spending and ongoing property taxes. Do ADUs provide affordable housing? Yes, but in a very unique way that does not fit the standard idea of affordable housing as an institutional product. What are the barriers to ADU development? Local rules are the most obvious barriers, but it ESSENTIAL to note they are not the only ones. What further research needs to be done? Researchers should continue to examine the development and use of real ADUs, using field data instead of planning assumptions to quantify the effects of ADUS in contrast to other housing types. In short, there is compelling, if early, evidence that ADUs benefit the community in the areas of environmental impact, reduction in car use, and a non-institutionalized style of affordable housing. I also anticipate that positive effects for older citizens (“the elderly”) will become more notable as time goes on. Meanwhile, I have found zero objective evidence supporting two specific fears often mentioned by ADU opponents: parking problems and declines in property values. This is not to deny those things could ever happen – perhaps new evidence will emerge – but there is no basis for them right now. When it comes to the less objective hopes and fears mentioned by ADU advocates and opponents, such as (paraphrasing here) ‘strengthening family ties’ or ‘bringing in undesirable residents’, it is harder to measure things and make statistical comparisons. However, the anecdotal accounts in comments from ADU owners, and in the case studies on accessorydwellings.org, are so consistent I feel confident making a few more tentative conclusions. ADUs support families in several ways. They serve as a flexible resource that provides stabilizing income during some phases of life and provides housing for extended family during other phases. When they are housing family members, their simultaneous proximity and independence allows naturally supportive relationships to work smoothly. For example, when grandma lives in the ADU, she gets the help she needs with stuff like shopping, and can trade back child care – no commuting, appointments, or day care centers necessary. These kind of informal support services seem completely natural to the people who experience them. They’d probably be amazed to learn that, in some cities, Grandma wouldn’t legally be allowed to live with them — at least not if she had her own apartment downstairs. When you express single-family zoning in this way it sounds extreme, yet that zoning applies to much of our population. ADUs show there are many ways that families can live together. In this way, they are quiet refutation of the Leave It To Beaver “nuclear family” ideal, where a “normal, healthy family” is two parents and their children, and other relations and friends are distant satellites. As far as I can tell, very few people, even arch-conservatives, believe in this radical version of familialism anymore, yet zoning tries its best to enforce it. Second, ADUs are a small but meaningful step toward sustainable housing. What sustainability really means is a pretty big discussion that won’t fit in this blog post. However, it seems safe to say that sustainability involves finding a better balance between the production and consumption of essential resources (e.g. energy supplies). And that, I’d venture, involves making a choice of quality over quantity in lifestyle. As the case studies on accessorydwellings.org show, ADUs can provide a pretty high quality of life in small spaces that are inherently greener than the standard “SFR”. That quality of life comes not necessarily from the building itself but its context– e.g. to family, transit, etc. ADU critics must be acknowledged at least one way. It is true that ADUs are “infill” development that densifies existing neighborhoods. Yes, they are a mild, incremental form of densification in the sense that each individual ADU is only a tiny change that can have little effect on neighborhood conditions. But over decades an accumulation of ADUs probably would notably change the character and demographics of a place. Portland’s experience in the last few years provides an interesting comparison. Hundreds of permitted ADUs have been created, and there has been practically no reaction on a neighborhood basis — sometimes the new developments are hardly noticed. Meanwhile, an alternative form of densification, the transit-oriented apartment block, has caused a lot of protest. ADUs are not a panacea. They cannot solve every urban, family, or environmental problem. But, as I’ve documented in this series, they clearly have some benefits in those areas compared to standard American mode of “single family” development. Those benefits need to be quantified more, especially with comparison to other densifying forms of developments, but I have little doubt they exist. 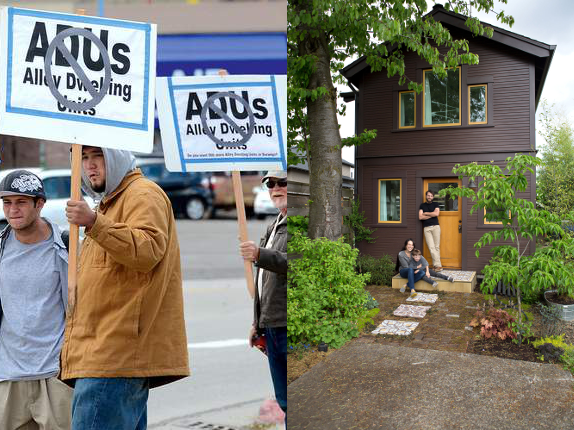 Beyond that, ADUs are simply a refreshing grassroots alternative to “big” development. To a design buff like me, there’s something tiresome about big apartment blocks, rowhouses, and other “professional” developments, no matter how well thought out. You can practically see the investment calculations floating over them, like the furniture prices in Fight Club. In contrast, ADUs are typically created and managed by homeowners, not real estate professionals. These homegrown residences are unique, each with a purpose and a story. Though the biggest single motivation for creating ADUs is financial gain, a notable fraction of these “amateur” developers make a fascinating choice – to not maximize investment return, for a month, a year, or a decade, so they can house a family member or a friend, start a business, or do something else to spread good beyond their yard. In short, they often show that people value things beyond money, and that may be the best pro-ADU argument of all. For some reason, your comments are not visible. There are 2 main problems with your argument, and I support ADUs in general. First, it is not the property values of people who build the ADUs that are of concern, but of neighbors, who worry their values will decline because of the reduced privacy and crowding. Second, saying that ADUs add a tiny amount to parking of the overall city is irrelevant. If they are built on streets and in neighborhoods where parking is currently tight, then they will add to the problem if the residents have cars. That is a big concern in the debate over ADUs in Austin, where I live. Hi Susan, thanks for your thoughts! It’s always nice to get a substantial comment. If you follow some of the links in the article you will see that (for what it’s worth 🙂 ) I’ve written in more detail about the concerns you raise. The issue of neighboring property values is extremely difficult to study, but I do what I can in the following post: https://accessorydwellings.org/2014/07/02/how-do-adus-affect-property-values/ . As for parking, I look at it more in this post — https://accessorydwellings.org/2014/07/16/do-adus-cause-neighborhood-parking-problems/ . The property values and parking issues are similar in that they are common worries about the consequences of ADU development. “Worries” is the right word, because these are hypothetical bad consequences. People foresee them, but they haven’t happened anywhere yet. Not saying those things could never happen, but there is no evidence for them at this point. I have not read about a single street in America where permitted ADUs are common enough to change parking conditions. On the other hand, there is evidence that ADUs have positive effects in other areas of concern to citizens. Ultimately, judging types of development by a single yardstick may not be that helpful. Consider parking — there are lots of places to live in America where parking is no problem, but that doesn’t make them desirable. It’s typically better-quality urban neighborhoods such as Seattle’s Laurelhurst where the ADU parking worry comes up. The people there live in Laurelhurst because it’s Laurelhurst, not because Laurelhurst happens to have parking. 🙂 Neighborhoods are a total package. Neighborhoods with less parking may be desirable in some other way — consider Central Park West. A better way to think about the effects of ADUs might be in the context of their total effect on neighborhoods compared to other kinds of densification. We must start by acknowledging it is impossible to hold a neighborhood static — it will change, no matter what the rules are, simply as a result of demographics and market forces. Now, in a place like Austin I imagine the change is in the direction of more people and more density. So, will these people be placed in a few giant skyscrapers? In numerous apartment blocks along corridors edging existing neighborhoods? Or will they be spread out more through neighborhoods in developments like ADUs, courtyard housing, etc. ? ADUs aren’t a panacea, but when you consider them against the other options, they definitely have some appealing qualities. I find the language used in this article to be indicative of extreme bias in favor of ADUs. It would be refreshing to see some objective analysis and time worn statistics to help citizens make informed decisions. There are plenty of surveys of happy, eve smug, ADU owners. But I have yet too see surveys of non-ADU owners who live nearby these developments. Why is that?? Hi Steve, thanks for coming to the site! To take the more specific question first, why aren’t there surveys of non-ADU owners who live nearby ADUs? I agree this would be interesting, but since legal ADUs are incredibly rare (e.g. even in the “mecca” of Portland they are only on 1-2% of properties), finding and surveying those people would be challenging. It’s easier to survey people who have developed ADUs since they are in the city permit system. This entry was posted on September 17, 2014 by Martin John Brown in Policy & Trends and tagged accessory dwelling units research, conclusion, familialism, family, featurepost, parking, property values, research, wrapup.